The International Energy Agency report (World Energy Outlook 2008) of December is even more instructive. Words like 'unsustainable' creep up quite frequently. It's the first time someone took a look at the actual production data worldwide instead of estimating/guessing/wishing. They surveyed 800 of the biggest oilfields in the world (three quarters of current world production) and were astonished to find an annual overall decline rate of 6.7% (the IEA previously 'estimated' 3%). Which means that by 2030 we need the equivalent production capacity of four additional Saudi Arabias just to keep production at the current level of 85m barrels/day. And that doesn't take into account the expected demand growth of the BRIC countries. China alone will probably consume 10mb/d more. Another slap is the fact mentioned by the chief economist of the IEA Fatih Birol that offshore fields decline faster than onshore fields, while being more costly to exploit and less yielding. So much for offshore drilling (which needs to be done) as the ultimate saviour. So where are those four or five additional Saudi Arabias gonna come from? Like climate change this is a serious risk that needs to be managed. See the amusing feature by George Monbiot where he meets Fatih Birol. 1) There is actually no such thing as the price of oil. The headline price of oil quoted in the US media is actually that of two particular grades, West Texas Intermediate (WTI), which is used as a leading index relative to which other grades of crude are priced in the spot and futures markets. WTI is a light (mostly relatively short carbon chains) sweet (low in sulfuric compounds) crude that normally commands a premium price because it is easier to refine into value-added products like gasoline and ULSD. There's also a lot less of it on the market than there is of heavier and sour crudes. The high quality is why almost no WTI is exported, just distributed to refineries throughout the Midwest via pipelines. However, the pump systems installed in oil pipelines only work in one direction. No-one installs the additional pumps needed for reverse flow operation because there usually isn't any demand to justify the incremental investment. Ergo, there is currently no way to deliver large quantities of WTI from the main distribution hub in Midland (TX) to the oil tanker terminals in Galveston. However, there is right now a very unusual temporary glut of WTI. Some claim GOP backers in the oil industry were cranking it out before the election to depress gasoline prices in swing states like Missouri and Iowa. More prosaically, short sellers of stocks often hedged their bets with longer-term oil futures before the collapse of Lehman brothers. When the market collapsed and demand for oil futures fell sharply, the contracts still had to be honored at pre-collapse prices. This explains why Exxon just recorded it's highest-ever single-quarter profits. All that produced crude had to be stored somewhere. CitiGroup (yes, they of TARP fame) even chartered a tanker for the purpose because all the storage facilities on land were at capacity. As a result, WTI currently trades at a discount of ~$10 relative to inferior imported sour crudes, which refineries in many states (incl. California) depend on. Production of those has been throttled back in response to globally depressed demand. This is why gasoline prices in the Golden State are already trending up even though WTI prices are still depressed. Once consumption mops up the excess stockpiles of WTI, it will quickly command the customary premium over inferior grades. The unusually rapid run-up during the Bush years was caused by a combination of robust global growth, limited spare production capacity and a war raging in Iraq that could have spilled over to neighboring countries. Saudi Arabia at first held back on investing in additional production capacity, because it had been badly burnt in the last boom-bust cycle. It takes 5-10 years to bring new capacity online, so that country - traditionally a US ally - had no way to stabilize prices by increasing its own supply. Of course, eventually they did invest and some of those will be operational in the next few years (there's a point at which shelving such projects becomes more expensive than completing them). If the current global economic crisis takes much longer to resolve than recent recessions, the brand-new production capacity will simply be held in reserve. 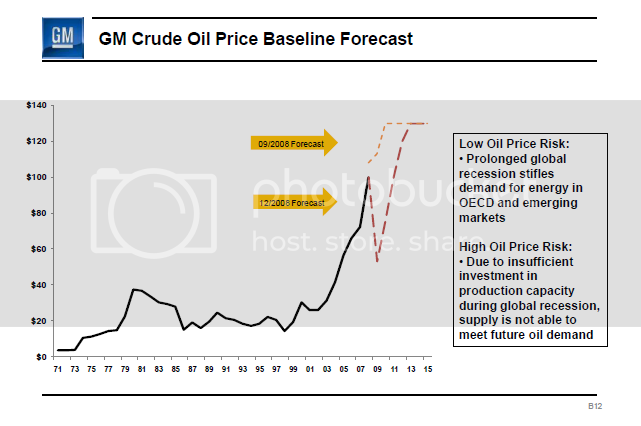 Between that and the new US policy of an orderly withdrawal from a less chaotic Iraq, it is unlikely that oil prices will see the return of a large speculative bubble in the medium term. At some point, the current global recession will be over and economic growth will resume. China is one major nation that is actually still growing, albeit at single-digit rates. Throw in global population growth and structural demand for fossil oil is likely to increase. At some point, of course, the economic and geopolitical pain becomes severe enough to make investments in energy efficiency and self-sufficiency worthwhile. We already saw this in the trend toward diesels in Europe and more recently, hybrid electric cars in the US and Japan plus aggressive investments in production capacity for liquid biofuels (bioethanol, biodiesel), as well as R&D advances in many other alternative technologies. Switching to more transit-oriented lifestyles, including HSR use, takes that one large step further. The success of the investment depends on crude oil and/or liquid/compressed gaseous biofuels becoming sufficiently expensive in the long term, in addition to the growing inconvenience and opportunity cost of congestion on roads and at airports. The risk is relatively low because alternatives to crude oil will be expensive to produce. Now that oil is (temporarily) cheap again and consumers have no access to credit for buying a new car, demand for all of these alternatives is down. Burdened by massive legacy pensions and health care obligations to its retirees, GM has no choice but to bet the farm on its E-Flex architecture, of which the Chevy Volt will be the first application in the US. This efficient but expensive concept combines electric drive with a large, heavy Li-ion batter pack and what amounts to an emergency generator - euphemistically dubbed a "range extender". Normal operation will be based on the stored electricity obtained from the grid overnight or at special rapid-charge stations that still need to be set up. If you go easy on the accelerator, leave the heater/airco firmly in the off position and travel over level terrain without much of a headwind (aka "normal operation"), you might get 40 miles out of a single overnight battery charge. That's good enough for most commuters, so the range extender will only be fired up rarely. The per-mile fuel cost of running on electricity is much lower than that of running on gasoline. Electricity can also be generated from any number of domestic primary energy sources, including coal, gas, nuclear and renewables (hydro, geothermal, wind, solar, biomass wave, tidal). And, as long as you're driving on grid electricity alone, there are zero tailpipe emissions. Unfortunately, E-Flex will retail at a premium of around $15k relative to similar vehicles with conventional drivetrains. That kind of premium only makes sense if gasoline is seriously expensive (probably $6-8 rather than $4) or, if consumers are given generous tax credits for purchasing such vehicles, justified by their contribution to national energy security. That, however, would mean finally admitting that keeping the headline cost of oil and gasoline low has come at mind-boggling cost to taxpayers due to out-of-control defense spending. However, don't hold your breath: the military-industrial complex makes generous contributions to most political campaigns, most elected officials strive to make the cost of market entry prohibitive to secure their livelihoods and, the mainstream media make a bundle on political ads. That's why they're giving excessive airtime to GOP politicians now, in the hope the party will recover quickly enough to make the 2010 midterms and especially, the 2012 presidential election at least mildly competitive. It's unlikely that politicians will risk upsetting the apple cart by actually raising (egads!) fuel taxes permanently or reforming campaign finance. They are especially unlikely to do it just to save GM's bacon. The upcoming $30 billion bailout may actually be no more than an expensive stay of execution until the country has weathered the worst of the recession. Liquidation in the short term would add massive burdens on unemployment benefits, Medicare and the Pension Guaranty Corporation at a time when the federal government can least afford to accept those losses. - End of the road for US auto industry? Rafael, pardon my curiosity, but where did you learn so much about economics and oil prices, and second what is it that you do for a living? yes! I love it when gas prices go up and up! Screw car and suv. Public Transportion is where it's at! The article's basically just wrong. Take a look at some actual price graphs (from gasbuddy.com). Yes, retail gas prices have gone up slightly in the last few months while the price of oil has bounced around a bit, but there's nothing particularly dramatic about it. my dad worked on long-term planning for an oil company before he retired. Also, I read web sites and articles on the gyrations of the price of oil, e.g. 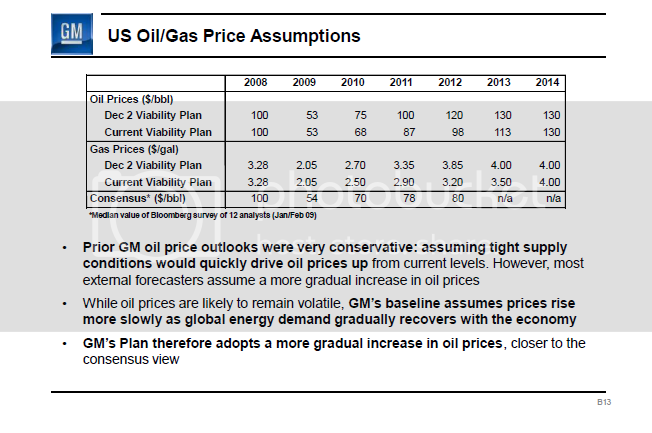 on WTI vs. gas prices, WTI's future as a benchmark, Citigroup's dabbling in the oil futures market, the Oil Drum blog etc. Of course, while more fuel-efficient cars would be hugely useful, especially in North America, they do exactly zip to address road congestion. If you're going to sink $40k+ into a fancy E-REV or Tier 2 Bin 5 turbodiesel, you want to actually be able to go places with it. You don't want to be stuck in endless traffic jams and then waste a lot of time looking for a parking space, e.g. in SF. That's why I'm also interested in promoting alternatives to driving as such, i.e. telecommuting, transit and bicycles. And while we're at it, short-hop flights in busy corridors are not necessary, just pure concentrated evil. That's where bullet trains come in, preferably with reliable, low-latency broadband internet access at 220mph. Long-distance flights and flights in less busy corridors still make sense, especially now that planes are becoming more fuel-efficient as well (cp. A380, Boeing Dreamliner). High gasoline prices are going to come back. We have a little breathing space, it might be six months or six years, but four dollar plus gas is in our future. You don't need any fancy graphs or studies to know it. As soon as world economies start to recover the cheap energy game will be up here in America. (possibly for good this time) Even if actual demand isn't enough to raise prices speculators and manipulators will do it. The only real question is; how will we use our respite. Will we go back to business as usual or will we have the discipline to use the time to invest in alternatives. If they land around 3 bucks a gallon its good for rail. don't fill up in Japan or Europe, you'll have a heart attack. $3/gallon would still be dirt cheap. What you should be asking for a DoD budget of $100 billion a year (currently $500 billion), zero unwinnable wars, lower general taxes and $6/gallon (or more) by EOY 2018 due to "national energy security fees" on oil-derived fuels. It's best to avoid simply raising the existing gas tax, or the proceeds will automatically be earmarked for highways. Proceeds should go into the general fund or at least, into a broader transportation fund. After all, subsidizing mass transit operations and the construction of transit villages means less congestion on the roads for motorists. In that sense, transit services and TOD serve the same purpose as constructing additional freeway lane-miles, only much more effectively. If anyone wants to have a bit of fun, there's currently a Fark HSR thread. Almost 200 comments already. The other day I listened to an interview of an ex-top executive of the oil firm Total. I couldn't take notes as I was driving but I remember the main points. He said the current oil prices are totally unrealistic and unsustainable both for the companies and the producing countries, which have engaged in expensive public projects whose financing requires a price of at least $150 a barrel. In his opinion, the price should stabilise, after the crisis, at $200-$250 for the next 20 years, if no political crisis interferes with the market. After this period, prices will start going up because drilling will be more and more expensive. If the market is ready to pay the price, there are reserves for another 100 years. In theory, a field ceases to be profitable when it costs a barrel to extract a barrel. My own opinion is that the primacy of oil as a source of energy is already eroding and other sources will prevail long before the reserves are exhausted. After all, the stone age did not end for lack of stones. "While most of the $8 billion is expected to go to Senate Majority Leader Harry Reid's pet project – a high-speed train linking Anaheim and Las Vegas – the state High Speed Rail Authority can expect $2 billion or so for its scheme." most of the $8 billion is expected to go to LA-Anaheim? Ridiculous, that's not even a designated HSR corridor yet and, it's not going to have it's EIR/EIS done by Sep 30, 2012. Harry Reid basically just relayed the President's request to map the $5.5 billion "at the discretion of the Secr. of Transportation" in the Senate version explicitly to HSR, to keep the $2 billion the Senate version had already allocated to it and, to find another $500 million in the transportation budget to make it a nice round number. The decisions regarding which corridors will get a slice of the HSR money will be made by the administration, not Congress. That was the whole point of eliminating earmarks. Obama's team is well aware of the California project and perhaps of plans to build a new relief airport for McCurran between Jean and Primm in the Ivanpah Valley, close to the California border. It's the only brand-new airport project in the country. Obama and Ray LaHood will take one look at the map and see that LV-Anaheim maglev would be a lot more expensive than LV-Mojave steel wheels HSR @ 220mph. If they're smart, they'll add that spur to the existing designated California corridor, tack on a segment of the new smart grid and spend say, $250 million on a combo fast-track EIR/EIS study. Proviso: the Ivanpah airport would have to be canceled if the study confirmed feasibility. That's because it's not certain that Indian gaming interests and anti-gambling zealots would accept a high speed rail link and, there are plenty of semi-endangered species out in the desert, e.g. the desert tortoise. Once Harry Reid is a happy camper, the Obamatons could go ahead and allocate say, $3 billion of the $9.5 total in the federal HSR kitty to the California system for Anaheim-LA-Palmdale plus $1 billion for SF-SJ. Those sections could enter commercial service long before the rest of the starter line is completed. The HSR test track that Morshi Morshed says he needs in the Central Valley might not happen up front. Instead, FRA would get a hundred million or so specifically to write the rules for HSR (both rapid rail and bullet trains) in Japan and Europe, with CHSRA engineers in tow. Let them do vendor qualification there while they're at it. FRA might decide to limit speeds to 320km/h initially, with a view to bumping that up to 360km/h once the CV test track is finally built. If 90 mph is high-speed, then cars on highways are a form of high-speed transportation. In Italy, where the autostrade are relatively uncongested and speed limits are ignored, a good car can do 120 mph. The reason the TAV gets any ridership is that it can routinely beat that. It's not even a cost effectiveness issue. Most FRA-designated corridors can support true HSR - for a start, Chicago is marginally smaller than Paris, and all other cities in the Chicago Hub network are considerably larger than Lyon. actually, the Joint Explanatory Statement (Division A) of the conference report for HR 1, the stimulus bill, referred specifically to high speed rail as the type that had received $1.5 billion in initial funding in HR 2095, last fall's omnibus rail safety, Amtrak re-authorization and HSR bill. HR 2095 defines HSR as a service that can reasonably be expected to reach top speeds of 110 mph in normal commercial operation. That number stems from rules regarding FRA grade crossings at elevated speeds. For alignment sections rated at up to 110 mph, regular gates are good enough for any remaining grade crossings - though I think it would be crazy to use anything less that four-quadrant gates and curbs in the medians of the approaches on either side of the tracks. A series of such grade crossings qualifies for an FRA quiet zone that gets rid of those infernal warning bells and horns. Between 110 and 125mph, FRA requires an impenetrable barrier instead, though it does not specify exactly what that should be. That's fine, let the engineers figure that one out. The objective is clear enough: ensure that motorists and pedestrians in a hurry cannot cut in front of a rapidly approaching train. Alignment sections with a speed classification in excess of 125mph must be grade separated, which is the safest but also the most expensive course of action. I do have to say since moving back to the city and getting rid of cars, It is so freeing to not have to go to the gas station, worry about gas prices, worry about repairs, worry about payments and insurance, worry about tires, and worry about where to park everytime I go somewhere. It is a huge burden that has been lifted and far outweighs the drawbacks. No question about it. Think about the absurdity of dragging around thousands of pounds worth of metal with you every time you do something.